"We should like to thank, and show solidarity with, everyone in France who marched against the attack on Iraq by the Bush administration. We were one with the people of France, and we remember. We who march against the war are the true allies!" 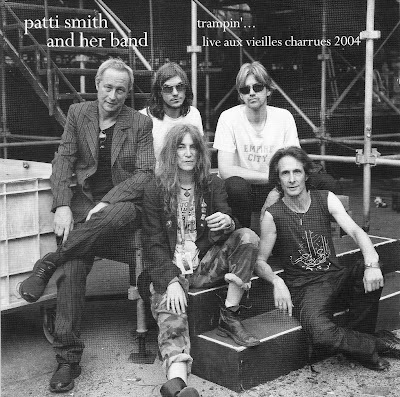 With that righteous battle cry, Patti Smith introduces "Jubilee", which kicks off this smoldering set -- "enregisre par Radio France le 24 Juillet 2004 au festival des Vielles Charrues" -- from a bonus disc included with a limited-edition French release of her 2004 album, Trampin' . Patti's stalwart band -- old cohorts Lenny Kaye and Jay Dee Daugherty, with Oliver Ray and Tony Shanahan who started with Patti on her late-'95 comeback shows -- have never sounded tighter or more intense. Lenny, in particular, pulls off some guitar work that could've come right off the original Nuggets colllection of '60s psych-punk he curated back in 1972... unless it's Oliver playing those licks, that is! The great setlist is split about evenly between pre- and post-comeback material. I'm not completely sure whether this 72-minute disc features the entire show Patti performed that day, but it was a festival set, so that sounds about right. Here once again on The Rare Stuff is the High Priestess of Poetry and Rock 'n' Roll: the immortal Patti Smith! Info in comments. If you get a link, let us know what you think! met her two weeks ago in a bookstore. that was heavy !!!!!!!!! any chance for a reup of this?